West Windsor, N.J. – The computers in the computer labs at Mercer County Community College (MCCC) eventually outlive their assignment in Higher Ed. In the past, the college shipped them off for recycling. But these days, they’ve been given a new life as part of the Trenton Digital Initiative (TDI), a Mercer Street Friends (MSF) project that refurbishes them and places them in the homes of area residents. Since TDI began a year ago, the college has contributed close to 200 computers, as well as keyboards and other spare parts. Mercer leads the pack of contributors, which also includes the Mid-Jersey Chamber of Commerce, Rider University, Trenton Rotary and several local computer companies. Some 350 computers have been donated thus far, many of which are now back in action. According to MSF Executive Director Shannon Mason, after just one year, TDI is far exceeding expectations. “We have already placed scores of computers in people’s homes. It has taken off much faster than we thought,” she said. 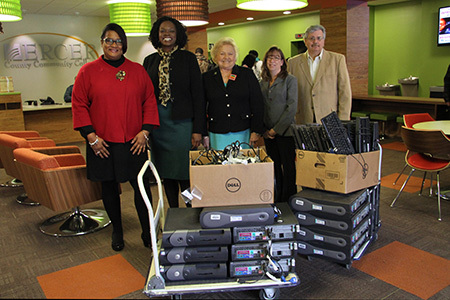 MCCC's latest computer donation is from the Trenton Campus's Learning Center. From left are TC Provost Monica Weaver, MSF Executive Director Shannon Mason, MCCC President Patricia C. Donohue, MCCC IT staff member Sue Holman, and MSF IT Specialist Dave Zboray. Mason notes that the lifeblood of the program is a community that cares – area organizations with computers to donate, volunteers willing to give their IT expertise, including a retired IBM executive and a Princeton University researcher, and others who have made monetary donations. First, MSF found a way to refurbish the computers inexpensively, using software known as Ubuntu, a Linux-based operating system that is free, open source software and Microsoft Office compatible; it includes word processing, a spreadsheet program, a presentation program and Firefox. Second, through its Internet Essentials program, Comcast is providing MSF clients a special rate of only $9.95 per month. Then there are the not-small matters of developing a team of workers to refurbish the machines and teaching people on the receiving end how to use them. MSF had answers for those issues as well, ones that are central to its mission. If a computer malfunctions, the TDI team is ready to provide tech support. “If a computer breaks, sometimes we can trouble shoot a solution, or it can be replaced,” Zboray says, adding that a long-term goal is to have a help desk where clients can call in and get tech support from young trainees. Clearly, the program has hit on a need on both ends -- and in the middle: organizations that want to see their old computers put to good use, young people who can benefit from IT training, and families whose lives will be changed for the better with a computer in the home. If Zboray needed any proof of the kind of change that can result, he got it early on. One of his very first clients, a single dad, was out of work and looking for a job in the food service industry. Once he had a computer in his home, he was able to do an online search and, within a short time, had gotten the job he wanted. And now his entire family is connected to the world.